Wash the brussel sprouts and trim ends and any discolored leaves. In a food processor, slice Brussel sprouts as thinly as possible. You can do this with a knife as well, lay flat side down and slice thin. Please, if using a knife, be careful. Mince garlic and shallot, add to the brussel sprouts. Add cheese to the bowl. This dish tastes much better when left to sit overnight for the flavors to combine properly. Cover tightly with plastic wrap and store in the refrigerator. When ready to serve sprinkle top with ½ teaspoon kosher salt. 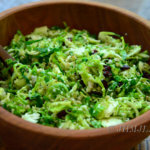 This Brussel Sprout and Walnut Salad recipe is gluten free and vegetarian. Check out our FREE App to help you explore new Vegetarian products at your local grocery store.